Just Another Day in Japan: I got a potato! Sometimes high school students will cook outside with their classmates, especially during the winter. Usually they make mochi or grilled meat, but looks like today they cooked some sweat potatoes! 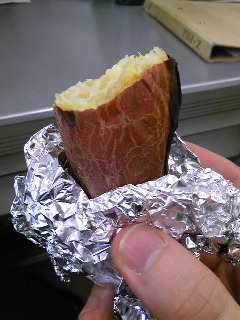 Some first-grade girls just came in to give me a 焼き芋 (grilled sweet potato). At first I thought it was wrapped mochi. Phew! Update: Apparently you're not supposed to eat the skin. Ooops. Thanks, VeryMango!